Are Two Sinks Better than One? There are many benefits to equipping your bathroom – or bathrooms, depending on how adventurous you are – with dual sinks. They’re stylish and perfect for large or growing families, and are also extremely functional even with only two of you living in the house. Whether you’re a family of four looking to expand an existing vanity or retirees shopping for a new one, the dual sink option definitely has its benefits. Who doesn’t want to have their bath and beauty products easily accessible in the cabinet above their own sink? Having dual sinks creates space for two people to store their creams, shaving kits and necessities separately. Instead of rifling through a family member’s various moisturizers to find your makeup remover and accidentally spilling the contents of a cabinet into the sink and possibly breaking said products on the way down, you’ll have your own space for your products. 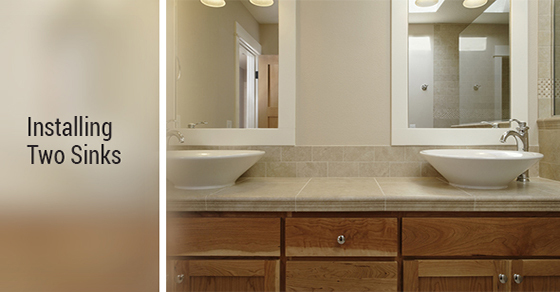 Dual sinks can also be extremely time efficient thanks to the addition of their accompanying second mirror. Dual sinks equals dual space and likely more room than you can need. Not bumping elbows with a child or spouse while brushing your teeth is a luxury granted to those with proper bathroom planning! Oftentimes we find ourselves waiting for the sink. In the morning as we get ready for work and at night as we prepare ourselves for bed are prime sink using times. Most of us – male and female, old or young – have a morning and night routine that involves us spending quite a few minutes in the bathroom standing at the sink. With dual sinks, two people can undergo their routines and save time in the process. If you have children, this will make mornings before school a streamlined process. Which, for any parent, is a welcomed change. More time saved at the sink translates to more time spent with the family. If you’re planning a bathroom renovation, a second sink should be at the top of your list. By saving yourself hassle and time, you’re allowing your family to start and end their day in harmony in a space that will be better fashioned for multiple people.